Retirement 2.0: Magda Szabo. The Door. 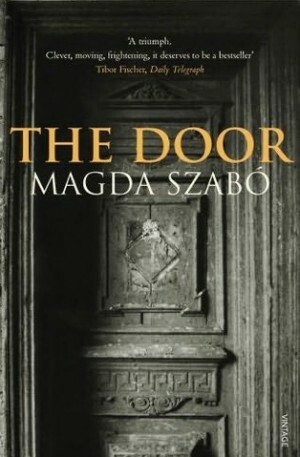 I recently read Magda Szabo's novel, The Door. Szabo is an Hungarian writer, the novel is set in Budapest, and I bought it in a small bookstore in Buda. So it came to me with many associations (and self-induced) demands. During the last several months, I have read many Hungarian novels because I knew they were important--even when I wasn't always sure I liked the book. The Door is an extraordinary novel--read in Budapest or anywhere else. The Door is narrated by a young female writer who has been pretty much silenced In Hungary. The book opens when she and her husband are looking for someone to help keep their flat in order while they work. They are referred by a friend to an older woman named Emerence who might take them on. (It is Emerence who interviews the young couple, rather than the other way around.). Happily, they pass muster and Emerence includes them among the people she cleans, cooks, and shovels snow for. Emerence is a strange and enigmatic character. Although she rules the neighborhood, no one is allowed in her house. During the twenty or so years in which the novel takes place, Emerence and the young writer become close, even to the extent of Emerence treating her like a daughter. But it is always on Emerence's terms and according to her standards of behavior. The secret of her house, like that of her past, is kept tightly guarded. Eventually the young writer becomes recognized in Hungary and is awarded a prestigious prize. In a strange plot twist, the writer is forced to choose between rescuing Emerence and attending the prize ceremony. Her failure to make the right decision is foreshadowed in the novel's first scene. Emerence and the writer live in two versions of Hungary under Communism. Emerence survived World War II and prides herself on being a worker. She does not consider writing "work," and views the writer as spoiled and hapless. The writer comes from a privileged family and is able to sustain a somewhat luxurious life even in the midst of what would have been hard times in Hungary. Both women are, in their way, admirable, but it is Emerence who holds the power--both in her unrelenting standards and in the secret past that lies behind her door. The Door is a compulsively readable novel. Many of the reviews mention its autobiographical elements, but if it is autobiographical it is in no way sentimental or self-forgiving. There is apparently also a recent movie starring Helen Mirren as Emerence, and I can well imagine her in the part. But the novel's language--it's style, tone and affect--creates a world that is uncanny and is difficult to visualize, even for someone reading it in the city in which it's set. There is something deep, elemental, and Greek (as the novel hints) in its tragedy--a tragedy born in Hungarian history but hidden behind the barriers of conventional life.